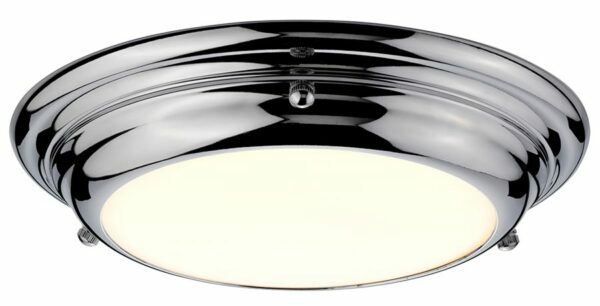 This Elstead Welland small flush mount LED bathroom ceiling light in polished chrome is rated IP44 and features traditional style and low profile. Circular ribbed flush to the ceiling mount and opal diffuser for a softer light. This bathroom light produces 1080 lumens of warm white light from the non-dimmable integral 12w LED’s, with a long lifetime of up to 40,000 hours. The Welland flush has a low profile, is IP44 rated and ideal for low ceiling bathrooms and corridors. Fitted with a high quality integrated LED module to make it energy efficient with a long lifespan and give very high lumen output. It is constructed in mild steel, plated in polished chrome and suitable for both traditional and contemporary bathrooms. A stylish bathroom ceiling light that boasts a hint of classic style and looks fantastic in period, traditional and contemporary bathrooms alike. Energy efficient, rated IP44 and suitable for zones 1 and 2, it’s specifically designed for use in bathrooms but can be used anywhere inside your home except wet rooms. This energy saving light is supplied by Elstead Lighting, a British company that specialise in the manufacture and distribution of quality decorative lighting such as the Welland small flush mount LED bathroom ceiling light in polished chrome and rated IP44 you see here.